As you know, on Wednesday Apple introduced Retina Flash. Designed for the 5MP front-facing cameras on the latest iPhone models, the new feature turns the phone's display into a True Tone flash for selfies. According to Apple, the flash will auto-adjust the white balance to enhance natural skin tones. 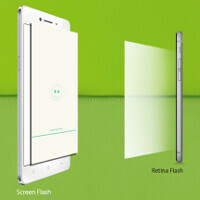 Retina Flash will provide a light that measures three times brighter than the display's maximum brightness level. As it turns out, Oppo wants to get its due. The manufacturer's Indian Facebook site says that its similar Screen Flash gives selfie snappers a light from the screen to brighten "even the darkest areas." According to the manufacturer, this feature has been available on the Oppo R7, Oppo R7 Plus, Oppo R7 Lite and the Oppo Mirror 5 before it was unveiled for the Apple iPhone 6s and Apple iPhone 6s Plus on Wednesday. Oppo does take a dig at Apple. The message on the Oppo India Facebook page makes it clear that its Screen Flash is now being "flaunted by others as Retina Flash." And so no one misses the point, the post shows an image of both Screen Flash and Retina Flash side-by-side. As usual, the days following the introduction of the new iPhone models are usually the time when other manufacturers try their best to take on Cupertino. It is a losing battle though. Ask any number of consumers which phone came out first with a flash for selfies embedded in the handset's display, and 99 out of 100 will say the Apple iPhone 6s (or Apple iPhone 6s Plus). Guess what? Blind iFanboys will say that Oppo is copying. But remember, first come first serve. Just like Huawei being the first smartphone manufacturer to offer Force Touch technology on their smartphone. Nah, both need to thank Apple for being in business. Second, the Apple was first with forced touch. Get some medicine for that bu**hurt! Force touch is force touch regardless if it's the watch or the phone. Also, is this so called phone even out or going to be out before the iPhone? Can you buy it now? Dolcelax is on sale at Amazon. Get it while supplies last! These have been out for several months. So by your logic multi point touch and capacitive touchscreens are multipoint touch and capacitive touchscreens whether they're on a smartphone or not. Given that, Apple was not the first for either technology. Lol you can't read. Just look at the recent articles.. Oh you can't you read. Apple being in business last years , is the biggest disaster in the tech Word. And no. Even in this force-touch-BS they were not first. Nah, Apple is doing nothing but playing Catch-Up for the past few years. iOS can now have extra options for photos, documents, and menus. Now they have a 12mp camera. Now, finally, split-screen and minor multitasking on the iPad and an electronic stylus with pressure sensitivity. Yay. They caught up to 2012 and have the same battery life as their previous model. Talk to me when one of the companies come out with a game changer like the original iPhone, not some software feature. So Apple hasn't had anything game changing since the first iPhone. Remember how Steve Jobs said that no one was going to buy big phones? What phone do you use now? I bet an iPhone 6 plus. Who do you have to thank for that 5.5 inch screen? (or 4.7 if you have an iPhone 6) Give me the pleasure of reading from your fingers, tell me the nameos the company that changed the game on screen sizes? No, Peratech is the first that invented Force Pressure Touch, and is has been available since 2010, Nintendo DS2 and WII U has these pressure sensitive screens..
you hav got serious mental problems Kruze.Feeling sorry for you. But "retina flash" sounds amazing and tempting. The magic world "Retina" always work , no matter that means NOTHING. i still dont get it, how, these sheeps still bow over the iphone, but thats cool, they go buy that amazingly innovative device, we get real innovations, with latest specs. i am so hyped, cant wait 29 september, its going to be either nexus or htc in my pocket! Well no, it's Oppo's "fault". They don't pay tech sites or spend on marketing like apple does! I don't think people are blind, but iFans are not stupid either. Apple phones are manufacture in China. If you don't see what's going on here, you are the one really blind. The people manufacturing Apple's devices are calling their momma, cousins, and dog, whatever. Essentially, these laborers are spies for the Chinese firms. Are you really are so naive not to believe so? If so I have a bridge I want to sell you. Is funny every time Apple comes out with a new feature, the Chinese OEMS have, too. Apple has to be diplomatic, essentially is all about money, but the rest of us don't have to pretend. They need poll for every Apple's "magic". How otherwise they will make it popular , and "new trend"?? I can't comprehend the last paragraph though... I'm stuck in believing whether the article votes in favor of Apple or OPPO. But lately, it's become a circus here.